Tá deireadh seachtaine mór ceoil beartaithe d’éisteoirí RTÉ Raidió na Gaeltachta agus do phobal Chorcaí mar go mbeidh an chraobh do Bhonn Óir Seán Ó Riada, Comhdháil na gCeoltóirí agus an Choirm Órdha ar siúl ansin Dé hAoine agus Dé Sathairn 1 agus 2 Feabhra. Dé hAoine ag 7 pm, craolfar an chraobh do Bhonn Óir Seán Ó Riada beo ó Óstán an Rochestown Park i gCorcaigh. Beidh 17 fidléir ar stáitse in iomlán, ina measc beidh deartháir agus deirfiúr ó Bhéal na Molt i bPort Láirge, Sarah agus Seamus O’Gorman, agus triúr ceoltóir a bheidh tagtha anall as Stáit Aontaithe Mheiriceá. Is é Ademar O’Connor, 15, as Éadan Doire i Uíbh Fhailí, an t-iomaitheoir is óige. Ba é Keelan McGrath a thug leis an duais anuraidh ar an mbosca ceoil. Ba é Darragh Curtin a thug leis an duais nuair a bhí an comórtas dírithe ar an fhidil go deireanach, sa bhliain 2015. Dé Sathairn, beidh 2 imeacht eile ar bun san óstán ceangailte leis an mBonn Óir. Ag 2 pm, beidh Comhdháil na gCeoltóirí ar siúl, le ceardlanna agus comhairle do cheoltóirí faoi chúrsaí foilsitheoireachta, cearta, deontais, poiblíocht agus a leithéid. Tá costas €5 ar an doras. 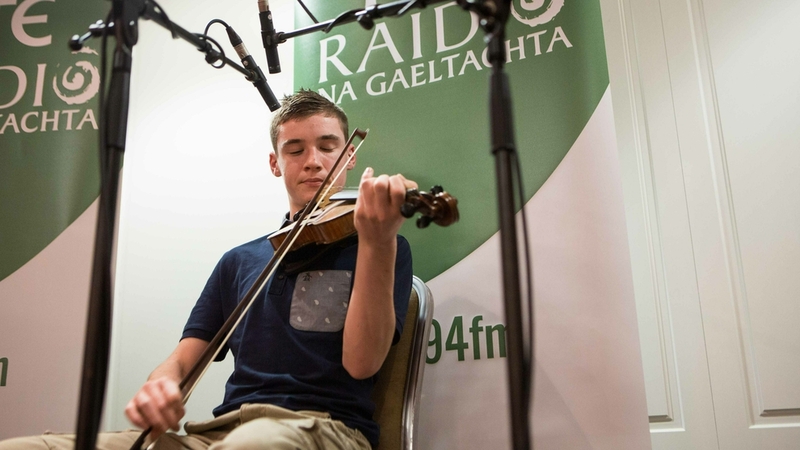 Ademar O'Connor, 15, from Edenderry in Co. Offaly will be the youngest competitor this year, and there will be three musicians flying in from the US for the event. The winner will take home the prestigious gold medal, designed by the late Cashel Goldsmith Pádraig Mac Mathúna, and a cash prize of €2500. Keelan McGrath, box, took home the top prize last year and Darragh Curtin was the last person to win the prize on fiddle.